At the end of 2017 Vidinge will produce 16 different mealsalads of 350 to 450 grams. Salads which are enough to fill an adult for lunch or for a dinner and which contain vegetables, protein like fish or chicken and carbs like couscous, noodles or fresh pasta, dressing and sometimes nuts, cheese or croutons. All with ingredients of the higher standards, because we believe that is what will make the consumer enthusiastic about our products and will make them come back to buy them. The salads can be bought to eat straight away, but you can also buy them to eat at home later on. We also produce side salads which have less content and are meant for a family at home. They might have cheese, nuts or croutons and always have a dressing so they are ready to eat. We will expand this range with more ready to eat salads in time; everything is possible at Vidinge. Vidinge supplies a wide range of cut and washed vegetables. Single like Blomkålsris, cut onions or cut grönkål or mixes like a kålblandning or a coleslaw. Almost all ingredients are also available organic. 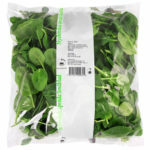 Vidinge supplies a wide range of cut salads and washed baby leaves. Single like spinach, iceberg salad or rucola or mixed like a napolitana mix or an land mix. The choice is endless. Almost all ingredients are also available organic. We also produce unwashed baby leaves like spinach, mache, rucola and mixes. Both organic and conventional and packed in either trays or bags.